Various store functions required two different steel grid patterns. 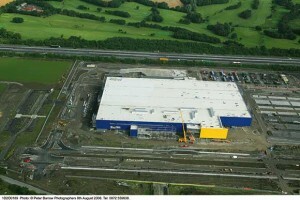 An IKEA furniture store and car park in Dublin contains long spans with heavy floor planks requiring the structure to be erected in box-like modules to allow the lifting process to succeed. Swedish furniture giant IKEA is entering the Irish market with the construction of its first store in the Republic at Ballymun, County Dublin. The steel framed store, which is due to open later this year, will have more than 1,500 car parking spaces and carry almost 10,000 products showcased in over 50 fully furnished room layouts. In house features will also include a number of ancillary facilities such as a 500 seat restaurant, a bistro, a cafe and a Swedish food hall. Atlas Ward Structures fabricated and erected 2,700t of structural steelwork for the building which has an overall floorspace of more than 53,000m2. Its scope of works also included the provision and installation of floor planks, staircases, precast walls, floor decking and intumescent fire protection. Overall, the structure comprises a ground floor undercroft car park with two floors above forming the main store. 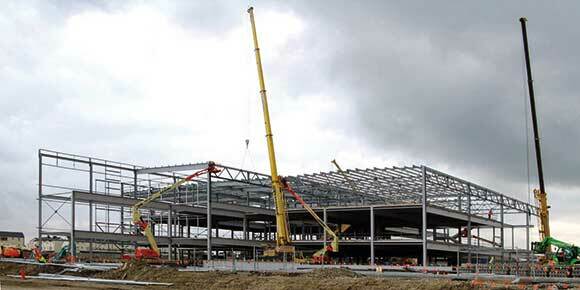 At ground level (car park) the steelwork is based around a 16m x 8m grid pattern. At first floor level, the building divides into a warehouse and storage area, which is two levels high and covers approximately 40% of the footprint, while the remainder of the building features a two level retail zone with a market hall on the first floor and a showroom zone on the second floor. A modular construction method was used because of the structure’s large footprint. The adjacent first floor market hall in contrast stays on a 16m x 8m grid. However, on the second floor, this changes, for the showroom area, to the larger 16m x 24m grid. “So at roof level there are a series of trusses, some spanning 24m and others spanning 16m,” adds Mr Fiddes. Because of the long spans and the high loadings which will be imposed on the frame, especially on the warehouse zone’s floor, large 914 x 419 x 388 beam sections were specified. These beams each weighed approximately 6t and carry planks which are 8m long and 400mm deep for the warehouse and 200mm deep elsewhere. In order to achieve an efficient and cost effective design all the beams were designed to act compositely with the precast floor units.